I’ve decided to reinstall the GNU/Linux system on my old X220 ThinkPad and in 2018 finally move on from UbuntuStudio 14.04 (Trusty). In the process of also trying out new Lubuntu (which I didn’t like for some quite aesthetic reason and retried with Xubuntu – much better!) 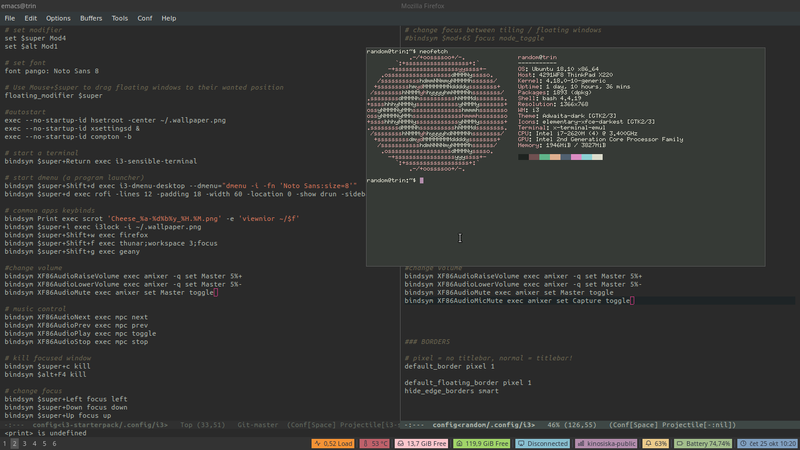 I also decided to finally try i3 window manager. So I wanted to quickly layout just some of the differences, that are quite subjective. I keep hitting (awesomeWM) shortcut to maximize a window. There’s no maximise window in i3. So I think there are number of limitations in i3wm – at least for somebody coming from AwesomeWM, which isn’t necessarily a bad thing. So these above are a moving target. I’m sure they will change as I will get used to features and non-features. Huge thanks to Adhi Pambudi for sharing his setup as i3-starterpack!